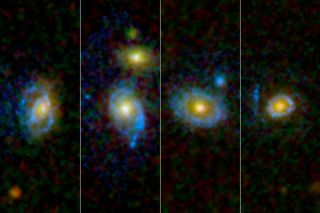 Astronomers have found unexpected rings and arcs of ultraviolet light around a selection of galaxies, four of which are shown here as viewed by NASA's and the European Space Agency's Hubble Space Telescope. Giant ringsof ultraviolet light have been spotted around some ancient galaxies, sendingsome scientists reeling from the completely unexpected phenomenon.? The oddultraviolet formations were spotted around several aged galaxies thatastronomers had presumed to be astronomically dead ? inactive, that is. Astronomersobserved the ultraviolet rings using two orbiting space observatories: NASA'sGalaxy Evolution Explorer and Hubble Space Telescope. They studied 30elliptical and lens-shaped "early" galaxies with strong UV emissions todetermine why they ? though ancient and having no visible signs of starformation ? were still emitting such energetic light. NASAannounced the discovery this month. Details of the research appeared in theApril 21 issue of the Astrophysical Journal. While youngand lively galaxies have bluish hues from their active stars, older galaxies emitreddish collective starlight, NASA officials said in a statement. This reddishtrait of the stars in the ancient galaxies allowed scientists to peg the agesof most of the stars at around 10 billion years old. When astronomersstudied the same galaxies with the Hubble Space Telescope, scientists discoveredthe source of the energetic look. ?Three-quartersof the galaxies were surrounded by tremendous shining rings of ultravioletlight. A few halos were so large they could fit several galaxies the size ofthe MilkyWay, and had ripples in their glow that stretched across 250,000light-years. ? Researchershave yet to explain how some of these galaxies received the infusion of fresh,cold gas needed to produce this light. One explanation, though unlikely,suggests that collisionsbetween the older galaxies and smaller ones lent the gas, new stars orring-structure directly. "Tocreate a density shock wave that forms rings like those we've seen, a smallgalaxy has to hit a larger galaxy pretty much straight in the center," saidthe study's lead author, Samir Salim, an astronomer at Indiana University inBloomington. "You have to have a dead-on collision, and that?s veryuncommon." Another ideais that the intergalactic medium, the thin material between galaxies,contributed gas and generated the rings with the help of bar-like structures atthe center of some galaxies. Ultimately,the striking observation proves that the cycle of galaxybirth and death has more to it than previously thought. "In agalaxy's lifetime, it must make the transition from an active, star-forminggalaxy to a quiescent galaxy that does not form stars," Salim said. "But it is possible this process goes the other way, too, and that oldgalaxies can be rejuvenated."?? Likerecurring seasons, it may be that barren galaxies can be awakened to breedstars again in another ultraviolet soaked "summer," NASA officialssaid.